Welcome! to the Points East Coastal Drive Area of south eastern Prince Edward Island. As you tour this eastern area you will be continually surprised at the sheer beauty of this region - the line of cultivated fields stretching to cliff edges, the unexpected forests of trees, white farmhouses with laundry blowing in the breeze, a tantalizing stretch of red dirt road to an unknown destination, the clear blue waters of the Northumberland Strait and fishing harbours. Listen for the sound of the steady drone of the fishing boats, while the fishermen work their traps traveling effortlessly across the water. Smell the tantalizing smells of cultivated earth as the farmers work the red soil and the wild rose bushes mingled with the salt air. Like a microcosm of the Island as a whole, this area offers diversity encompassing not only the three major industries of fishing, farming and forestry, but a variety of landscapes that include coastal cliffs and beaches, forests, rolling farmland, pastoral rivers, and the ever present waterways. You’ll experience the sense of peace and quiet, of an unhurried, timeless lifestyle that remains so elusive today in the eastern region. Perhaps what you will feel most strongly in this region is its peaceful, old-world qualities. For it is here, away from the crowds and amusement parks, that one can best experience what really personifies Island living - a sense of sharing yet remaining separate, of moving with the times while retaining qualities of the past. Magnificent views of hills, harbours, bays and dunes. 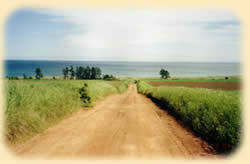 We invite you to come and experience eastern Prince Edward Island. Ceilidhs, (pronounced ‘kay-lees’) originated as “kitchen parties” and have grown into popular events. For anyone who can play an instrument, sing or dance in the traditional style, they will find that the many ceilidhs provide an opportunity to perform, thus capturing the true essence of these spontaneous musical gatherings. Feel the hospitable charm of the local inhabitants of the south eastern area, which is predominantly the Irish and Scottish heritage of the region. Our native Mi’kmaq people honor their spiritual traditions at the Abegweit Pow Wow held annually in mid August. The Cliffside views from the Panmure Island grounds provide the perfect backdrop for this celebration. All are welcome! The Panmure Island beach is an excellent swimming beach. Kilts and cabers abound at the annual Highland Games held in early August in Eldon at the Belfast Highland Provincial Park. Piping, highland dancing and traditional athletic competitions pay tribute to the Scottish heritage of the Island. Sign up for the Belfast Highland Greens Golf tournament and be sure to wear your kilts. In addition, many communities in our area host annual festivals that feature local entertainers. Discover our local craft and gift shops that are filled with island handcrafts. View quilts, pottery, paintings, jams, jellies, pickles, baked goods, music CD’s, knitted items and more, made on the island for you! Throughout the year, nature displays an ever-changing array of colours. You may find our roadsides abloom with lupins & wild roses, while fields fill with fireweed, daisies, brown-eyed susan, Queen Anne’s Lace and other wildflowers. Wooded areas are home to our provincial flower, the delicate “Lady Slipper”. On a sunny day, sun and swim on one of our beautiful beaches, we a surrounded by them. Overcast or raining try beach comb for shells, driftwood and pieces of sea glass. 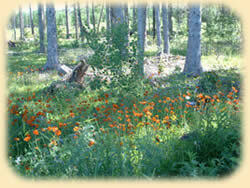 Our region is dotted with trails and other opportunities to experience wildlife in it natural habitat. From community festivals to church lobster suppers, country auctions, to the ’70 Mile Yard Sale’, friendly faces abound on ‘the island’. We enjoy meeting people that “come from away” and sharing the island ways. During our “wee” chat you will find the best spots to go for music, a feast of lobster or a secluded picnic. 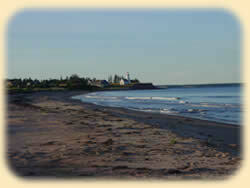 PEI is considered a very friendly place and those who come to visit often come back or purchase homes. The island is know around the world for our ‘Island Blue Mussels’, which you’ll see throughout the waterways. Most of our waterways is actually estuary's and have tides, which are needed for the mussel industry. 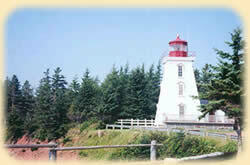 The island is well known for its P.E.I. potatoes, we also have lobster, scallops, lamb, and strawberries, high and low bush blueberries, dairy products and fresh vegetables. Freshly served to you from the local wharf, family farms or restaurants, they are all served throughout PEI in our restaurants! In the fall you can experience many island delights at our :Fall Flavor Festival, which is in the month of September. The festival is celebrated across the entire island and the island cuisine is bountiful. Our provincial government has ‘preserved the past’ by designating select roads “Scenic Heritage Roads”. While enjoying these drives, along these red dirt roads, imagine the horse drawing carriages or sleigh and the horseback riders of days gone by. These clay dirt roads are excellent for biking and walking and very maintained. The lighthouses that still guard our shores, architecture of older homes, churches, barns and commercial buildings whisper of times past. Our museum artifacts, photos, displays and exhibits will inform and entertain you with yarns of our past. The names of many villages and towns tell of the former communities from which our earliest settlers came. Our churches range in style from simple country chapels, to island stone structures designed by William Critchlow Harris. 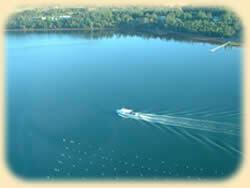 The harbours that are in the Points East Coastal Drive area are excellent for those of you who love to travel by water. You can travel the eastern end of the island visiting all the fishing villages by the water and drop anchor at beautiful wharfs. There are many of our harbours that can accommodate sailboats. Continue surfing our web site and learn more about what the Points East Coastal Drive area has to offer you when you come and explore southeastern Prince Edward Island.